Art is definitely a limitless discipline. We can find small slices of it everywhere in almost all things. Visual and fine art are among the many fields of art that are continuously changing, innovating and discovering new things – from the amazing methods of applications to using the craziest materials ordinary people won’t even believe can be a great source of art. 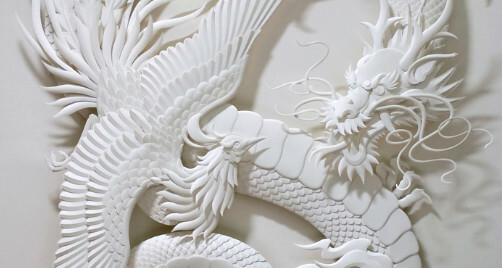 One crazy innovation that have been spanning over the years is the art of paper sculpting. Yes, you heard it right, paper is not just used in writing, drawing and painting but also in making jaw-dropping sculptures. The most common methods that might comes out of our minds in terms of paper art are “paper mache” or the popular Japanese art of paper folding called “origami”. Anyone can actually make their own paper art piece but only a few made this art a serious career – those who are gifted enough of seeing things in different perspective and making a blank of paper transformed into magnificent pieces of art. And to get us really inspired about the art of paper sculpting, we here at You The Designer have compiled some of the greatest names and their unique works in this field. Take a closer look in each of their pieces and realize the importance of the paper in your desk before throwing them into the trash. Enjoy! Los Angeles based artist Jeff Nishinaka is one of the most popular and internationally recognized paper sculptor in the past 15 years. His works is characterized by unique representational 3-dimensional forms of paper art. He has been commissioned to create sculptures for various clients ranging from private collectors, publishers, and multi-media clients. Jeff’s portfolio include works for Visa, Penn State University, The Peninsula Hotel, Paramount Pictures, Coca-Cola, among others. The largest collection of Nishinaka’s works belongs to actor Jackie Chan which is a close friend of him. Husband and wife tandem Allen and Patty Eckman have one of the most unique style in sculpting using paper. They use cast paper crafting technique in which paper fiber or pulp is formed using a mold which originated in Mexico tracing back from 1950’s. The couple had been applying this technique since 1987 in their main studio at South Dakota. The process would take nine months making each work so intricate in terms of details. Their masterpieces commonly depicts Native american scenes that most art collectors and enthusiasts would want to have paying whooping millions of pounds. The paper sculptures of Danish artist and author Peter Callesen is a nice example of how a plain white sheet of paper can be transformed into magical sculptures telling stories by just cutting and folding the paper. He creates intricate paper cut artworks usually depicting fantasy images and child-like imaginative subjects from A4 paper and even in large scale installations. He also works with a variety of other media including installations, performances, and monoprints. Born in Osaka and majored at the Kyoto City University of Arts, Japanese artist Tomoko Shioyasu creates floor-to-ceiling paper installations that are delicately cut by hand using utility knives and soldering irons. Most of her works depict some of nature’s most complex sights like the organic patterns of cells, water flows and some enormous wind forces. Her pieces are hung and you won’t believe they were not torn during installation. A highly talented Illustrator, Helen Musselwhite combines her skill in illustration and paper cutting creating colorful masterpieces depicting nature inspired scenes of flora and fauna elements. Paper crafting is maximized in her works making use of vibrant colors, visually appealing characters. Her style is mostly seen in fictional book covers and various art galleries. So there you have them guys! Paper crafts and sculptures are great sources of inspirations not just for designers but to all types of creatives out there. Do you know some other paper craft artists? Don’t forget to tell us about your thoughts by commenting below. You can also find us on Facebook, Twitter and Google+ for more updates. You can also subscribe to our blog for the most up-to-date design inspirations and stories.